Two-Factor Authentication is the best way to protect your account, turning your mobile device into a unique key generator. However, what happens if you lose that device, uninstall the two-factor authentication app by mistake or can't use it anymore? Here, you will find how to use the two back-up solutions we offer to help you use your account again. When enabling Two-Factor Authentication, ten back-up codes are generated and you can then save them on your hard drive. These codes can be used to replace any one-time password for your account, instead of using your Two-Factor Authentication application to generate one. 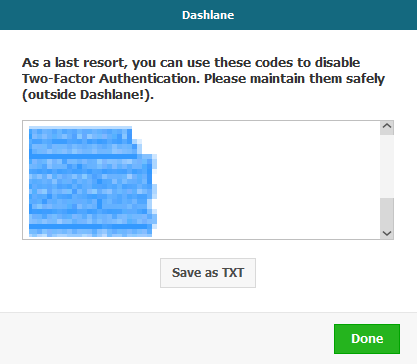 You can use these back-up codes to log in to Dashlane or to disable Two-Factor Authentication itself, depending on the Two-Factor Authentication setting that you chose when enabling it. Note that a back-up code can only be used once. If you used all your back-up codes, you may want to disable Two-Factor Authentication and start over, in order to receive ten back-up codes once again. Each time you disable and re-enable Two-Factor Authentication for your account, all your past back-up codes and one-time passwords (generated by your Two-Factor Authentication application) will not work anymore. You will need to use your new codes, so do not forget to delete the old ones and replace them with your new codes. You can also disable Two-Factor Authentication, using the back-up phone number set up when activating Two-Factor Authentication in order to receive more back-up codes. To do this, click here and follow the instructions. We will text your back-up phone with some new codes to disable Two-Factor Authentication. Please note that your back-up phone number is the one you chose when enabling Two-Factor Authentication. It is not the phone number you can change from the Preferences of your Dashlane app. If you get an error when entering your e-mail address on our Lost Phone page, then it may be that Dashlane could not detect in which country send the text message. You may need to check and change the country which is set for Dashlane. To do this, you need to open the application and log in to your account to change the Country setting. Of course, if you are locked out of your account, you can also contact us here. Please note that a limit of two text messages can be sent for each registered e-mail address per hour.